It’s funny how things work out. Sometimes you’re given a situation that can seem so dark that it’s easy to be overcome by it. Sometimes you even expect to be overcome. Nobody would blame you if you lost or gave up. Well, maybe me. 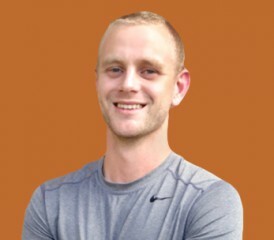 I’m Adam Lee, and I’m a personal trainer in Jacksonville, Fla. But I’m not just any personal trainer. You see, I have a family history with mesothelioma. And I have a thing about cancer: I don’t like it. I want to see it gone — forever. I give to cancer research. I like to help people who have cancer by motivating them not to give up, never to give up. When mesothelioma cancer became personal to me, I couldn’t give up. Let me tell you why. In the spring of 2011, just before my senior year of college, my stepdad, Jeff Wahl, was diagnosed with Stage IV mesothelioma. I had no idea what that meant. I just thought it was something you saw TV commercials about all the time. I quickly found out just how bad it was. After Jeff got back from the hospital from his diagnosis, he wrote the words “Never Give Up” on an index card and stuck the card on the bathroom mirror. You couldn’t look at yourself without seeing those words. You repeated them in your head over and over until you looked in the mirror again. As time went on and we all realized how big an opponent Jeff was fighting, his words became more significant. Not too long before his diagnosis, my mom and Jeff had bought a 1968 Shasta camper. It looked even older than it was — and just as beat up. This thing was rotted and rusted. It was a miracle they even got it back to the house without it falling apart on the interstate. Their plan was to remodel it. Jeff was a craftsman and could build or fix anything. Between his treatments, he’d be out there working on the camper. No matter if he was having a good day or a bad day, he worked on the camper. He had many bad days. His body didn’t handle chemotherapy well. Everything he ate made him sick. I watched a man who I thought was indestructible go from a ripped 185 pounds to about 115 pounds. He lost so much weight you could see most of his tumors. He lost so much strength that it became hard for him to walk without help. He fought. He fought hard. He never once looked as if he was giving up. Eventually, cancer spread to his bones and broke his arm from the inside out. My mom sometimes rolled him in his wheelchair out to the camper so he’d be able to work on it. I think his battle became more about how he could have a lasting impact even if he wasn’t going to be here to see it. Jeff Wahl passed away on Oct. 4, 2011. Cancer took his life, but cancer did not win. It never took away his mind or his will, even though it ravaged his body. His philosophy was cancer can’t win if you Never Give Up. That camper is beautiful today. Jeff finished dang near everything, except the plumbing. It looks just like it did in 1968. Jeff upheld his high craftsman standards. He rebuilt every little detail back into it. As I think back to Jeff’s battle with mesothelioma, I realized something about myself. It was back then that I decided what I wanted to be when I grew up. I’d always stayed in shape. I loved to play sports and work out. It was my way of life. Yet I never even considered it to be a potential job. When I saw Jeff put the Never Give Up label on his fight, I subconsciously adopted it. I had his mantra in my head every time I went into a workout. Fitness was my escape, my sanctuary. Every time I fought through a workout, I almost felt like I was fighting for Jeff. Jeff lost weight and strength by the day, yet he still sweated and heaved in the thick heat of Florida’s summer as he worked on that camper. The least I could do was finish a workout. Never Give Up: Are You Ready? I soon discovered the motivational effect the words Never Give Up could have on people trying to get in shape. I realized my family’s story did not end with Jeff’s death. I learned how much good could come from bad, how much light could come from pitch darkness. The brightest lights cast the darkest shadows, and I really do believe that. Jeff motivated me. I graduated on time from college and since then, earned two personal training certifications (ISSA CFT and NASM CPT). I use the words Never Give Up — just as Jeff wrote them — to help motivate others to reach their health and fitness goals, as well as raise money for cancer research. To me, Never Give Up is not a phrase. It is not a business slogan, either. Never Give Up is a definition. Are you willing to let it define you? The purpose of this blog motivation and fitness, particularly as it relates to people with mesothelioma and other cancers, but I wanted you all to know my story. I believe that through fitness, there are plenty of metaphors for life. Feel free to take what I write and apply it to however it relates to you. Maybe it’s waking up early and staying up late. Or it’s a big project at work. Perhaps, as in my case, it’s pushing through a workout. There is no morning that is too early, no job that is too hard and no goal that cannot be achieved. Greatness is reserved for those who will Never Give Up. Adam Lee is a personal trainer and blogger who writes for The Mesothelioma Center and his personal fitness blog. After losing his stepfather to mesothelioma, he offers his training services to raise money for cancer research. December 3, 2018 Could Asbestos Be in Your Favorite Alcoholic Drink?